For some, public transit is a means of getting from Point A to Point B in a way that reduces carbon emissions by pooling resources. Benzie Bus believes public transit can also provide a meaningful and educational experience. 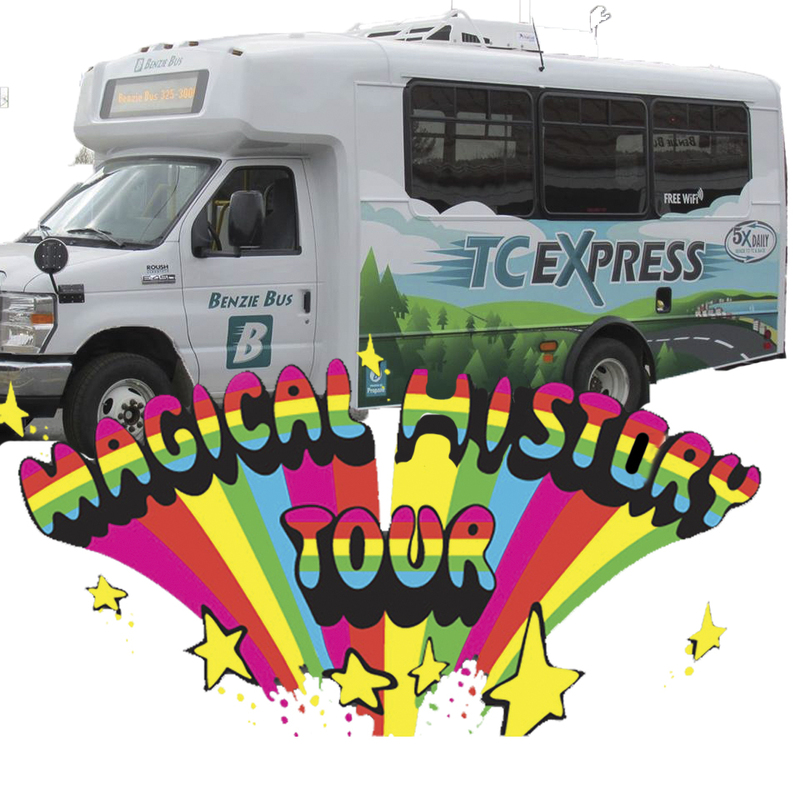 This summer, Benzie Bus will launch a history loop called the “Magical History Tour,” which includes many of the county’s most famous historical landmarks. During each of these 30-minute loops—which intersect in Beulah—a tour guild will enlighten riders with various facts and trivia about each site. The Magical History Tour begins on Monday, June 27, and continues each Monday throughout the summer. The idea—conceived by Bill Kennis, executive director of Benzie Bus, and other Bus employees—includes a multitude of benefits to riders and the community. Kennis hopes that everyone on the bus this summer will enjoy learning anew about old locations that weave the tapestry of Benzie’s past. The tours will visit both the most famous and infamous places in the county from previous decades. Some, like the Frontenac Royal Hotel, can only be remembered through historic Frankfort photographs. In its heyday during the early 1900s, the Frontenac—which was larger and grander than Mackinac Island’s Grand Hotel—was the prime destination for this important port town. Visitors will also see the remains of the Ann Arbor Railroad system that spans Frankfort and Elberta along what is now the Betsie Valley Trail. The old railroad ties are gone, but the train depot still welcomes visitors at the trailhead in Beulah. Along the way, Benzie Bus passengers can listen as their guilds—local student-theater actors—explain the history of car ferries on the Great Lakes and the railroad hub that was once based in Thompsonville. There will be two historic loops. The first runs from Frankfort City Hall to Grow Benzie on M-115, then to the trailhead depot in Beulah, before returning to Frankfort via River Road. Riders can disembark anywhere along the route knowing that another bus will follow. The second loop starts at Crystal Mountain and runs to St. Ambrose Cellars and the soon-to-be-open Iron Fish Distillery, then to Beulah where riders can decide whether to return to Crystal Mountain on Loop #2 or to switch to Loop #1. Passengers can ride all day for just $5. “It’s a great way to spend a day, rain or shine, and you can eat and drink along the way and leave the driving to us,” says Jessica Carland, the mobility manager for Benzie Bus who has been developing the logistics of this summer’s historic routes. Carland plans to correspond with businesses along the route to expand the collaboration. St. Ambrose Cellars, Crystal Mountain, and Iron Fish Distillery are among the companies that have already embraced the tour idea. Out of recognition that cultural tourism brings value to the community, the Crystal Lake Community Business Association has offered to pay for advertising for the historic tours. Seeing its role as a community asset, the Benzie Bus will accept further sponsorship advertising and will not make money off the Magical History Tour. “We will pass all proceeds for promotions and won’t profit from these tours,” Kennis says. Benzie Bus hopes that Crystal Mountain guests and employees will take advantage of these 30-minute loops, also. To join the Magical History Tour, call Benzie Bus at 231-325-3000 to book a ride or show up at the posted stops on Mondays between noon and 5 p.m. Benzie Bus will also renew its partnership with the Beach Bums minor league baseball team in Traverse City by continuing its ride program on game days. Starting Tuesday, June 21, until Tuesday, August 30, transit to the ballpark is free on Tuesdays and Fridays. Rides are available from Family Fare in Frankfort, Shop-n-Save in Beulah, and the Benzie Bus station, just east of Honor. Mitch Kennis is a graduating senior at Frankfort High School who is bound for Kalamazoo College in the fall. His father, Bill Kennis, is executive director of Benzie Bus. This is Mitch’s first story for The Betsie Current. Photo caption: Beginning Monday, June 27, the Magical History Tour will take place Mondays throughout the summer. Poorly Photoshopped image by Jordan Bates.